Ramiro Espinoza got acquainted with the work of Guyot in 2016, while attending the Expert class Type design (EcTd) at Antwerp’s Plantin Institute of Typography. Researching French and Flemish punchcutters with the prospect of creating a revival, Espinoza soon realized that the work of the most important masters of the period had already been digitized. However, he found the work of lesser-known punchcutters like Guyot, though perhaps not of the same superior quality as the others, equally compelling. And so a digital Guyot seemed in order. Espinoza decided early on that his Guyot was not going to be a facsimile typeface, but rather a modern interpretation aimed at the editorial market. Espinoza selected the most interesting elements from the Gros Canon and Ascendonica sizes and assembled them into a consistent family of contemporary detailing. During his year at the Plantin Institute of Typography, Espinoza researched several more punchcutters from the seventeenth century, like Nicholas Briot, Christoffel van Dijck, and Nicholas Kis. Details common to the types of that period — like an increased contrast and an enlarged terminal in the a — were applied to Guyot to give its look a more familiar and universal appeal. 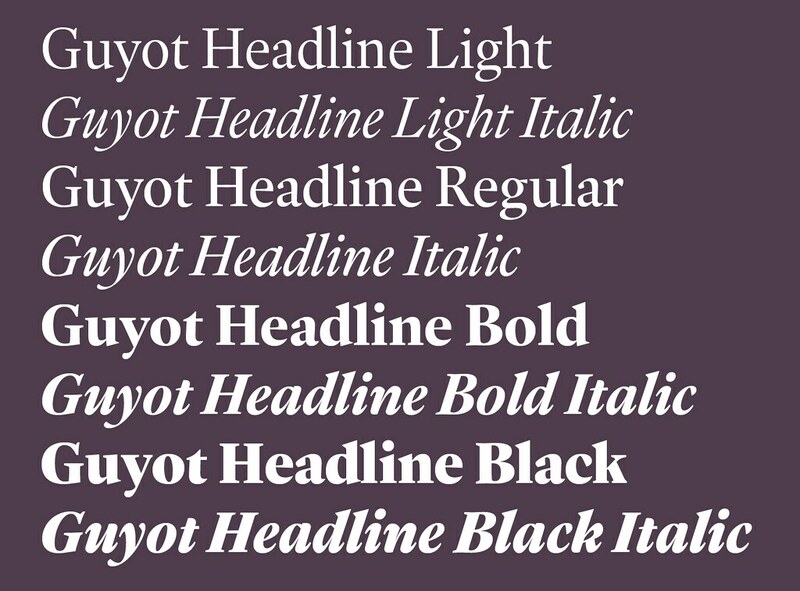 The Guyot family was eventually divided into two subfamilies: Text and Headline, to take full advantage of the possibilities of these optical ranges. In the making of this family, Espinoza drew on his past experience as an in-house newspaper designer. This background played a significant role in the decision to give the letters a sturdy appearance and sharp angles. Today Retype introduces Guyot Headline, a suite of feature-rich OpenType fonts fully equipped to tackle complex, professional type setting. The character set includes small caps, fractions, alternate designs, swashes, case-sensitive forms, and 6 sets of numerals. Besides standard Latin, its extensive character set supports Central European, Baltic and Turkish languages.